The Northfield/Dufferin neighbourhood has been a buzz for the past couple months working to improve a local neighbourhood park. Residents near Forest Drive Park (2035 Forest Drive) banded together with the City of Nanaimo Parks Department and many local businesses to develop a phased improvement plan. The first phase was brought to life under the City’s Volunteers in Parks Program (VIP). A playground targeting children 2-12 year olds was installed in June as part of the first phase of the park improvement plan. 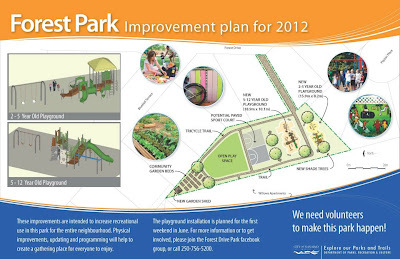 The next two weeks will focus on beautifying the park with public art. Artist Yvonne VanderKooi will be creating a park mural that depicts tales and themes shared with her by residents. Starting July 16th, she will also facilitate community based art projects with area families. Anyone is invited to drop into the park July 16th-20th from 10am-3pm to participate in the community based public art program. Public Art is a common method of bringing communities together and creating neighbourhood identity. The City’s Community Plan for Public Art supports public art installations at a city-wide (landmark) scale as well as in local neighbourhoods to increase a sense of pride and place. 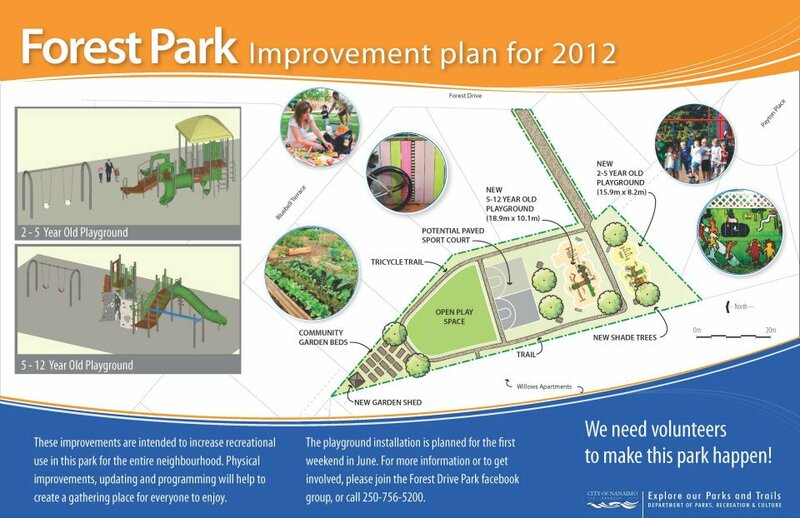 Additional park improvement phases will focus on landscaping, shade tree planting, a multi-purpose court and hard surface trail, and community gardens. Anyone wanting to participate in the public art or park improvements can drop by the park or check out the park’s facebook page .